I’ve had few books pique my interests and hold my attention as much as The Brendan Voyage by Tim Severin. 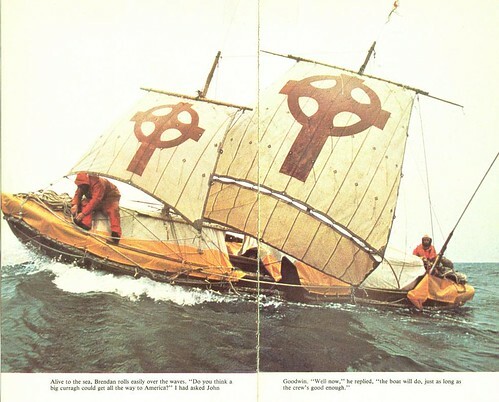 First published in May of 1978, it’s one of those books that after reading you ask, “Why didn’t I find out about this book years ago?” This book is the story of “how a crew of five, later reduced to four, sailed a medieval boat, [curragh] made of leather, across the [North] Atlantic . . . .” The author and crew were determined to prove that the legendary voyage of St. Brendan as related in the medieval text of the Navigatio was “not a legend at all, but a fairly factual record of a voyage to North American hundreds of years before the Vikings and nearly a thousand before Columbus. If you are as intrigued by Celtic history as I am, you will find this an exciting read, and you will delightfully learn more than you intended or expected. Severin’s prose is rich in historical and modern allusions and details, providing insight after insight into the minds of the medieval monks and what it means and meant to sail on the ocean in an ancient boat. “The seventh wave is said to be the worst, the one that does the damage in the turmoil of an ocean gale” (1). The Navigatio is said by many to be an Immram, an Irish voyage story. “It is the main surviving record of a Christian seagoing culture which sent boat after boat into the North Atlantic or regular voyages of communication and exploration . . . What sort of men, then, were these monks who deliberately launched out into the Atlantic in small open boats? Many must never have returned, but perished at sea” (259). Here is a photo of the Brendan, the curragh that Severin sailed to America. I stumbled onto the Brendan in an essay from “The First Americans” that was proposing a Pleistocene connection of the Solutreans of Spain to the Clovis & Pre Clovis dig sites at Cactus Hill, Virginia and Meadow Croft, Pennsylvania. This voyage has implications to retrodictions about the peopling of the Americas. What a gem of a find. When I was younger, I remember reading that Brendan’s voyage touched on the northern coast of South America. Do you have any information on that possibilty?